Ever since I was very young, I have been an avid reader. In first grade, I began reading the Boxcar Children series (we must have at least 100 of those books!) and Little House on the Prairie. (Although my all-time favorite book when I was young was Norma Jean, Jumping Bean.) In middle school, I graduated to the Wheel of Time series, the Golden Compass trilogy, and Harry Potter. Later, it was the Sword of Truth series, and of course, Twilight. I’ve always loved escaping into the worlds in my books, but what I didn’t know is that there was an even better way to get my, uh, “high”. It’s been almost a year since I discovered two amazing men. Their blog has the most amazing community I’ve ever seen online, but they are so much more than just a blogging duo. For the longest time I was intimidated by both of them – James is super confident, and quite the go-getter; Harry is mysterious, but the kind of guy that everyone and their mother wants to be friends with. And me, well, I’m easily intimidated. Just over five months ago, I began to get to know the both of them much better when I joined their RPG – Escaping Reality. Like I said before, it’s an even cooler way to get the escape I get from reading – I get to have my very own character who I get to write into the story. It’s very awesome. So I’ve gotten to know these two men to the point where I would consider them to both be good friends. And, well, I’ve found out certain things about them. Like how James has never had sushi. And won’t eat raw fish. And for the longest time refused to even consider eating sushi, because he thought it was all raw fish. (But it definitely isn’t!) (Don’t worry, I’ll convert him someday. Somehow.) On the other hand, I’ve found out that Harry loves sushi. Specifically that of the salmon variety. If it includes some sort of roe… even better. Slice the salmon into sticks 1 cm in diameter, and the length of a piece of nori. 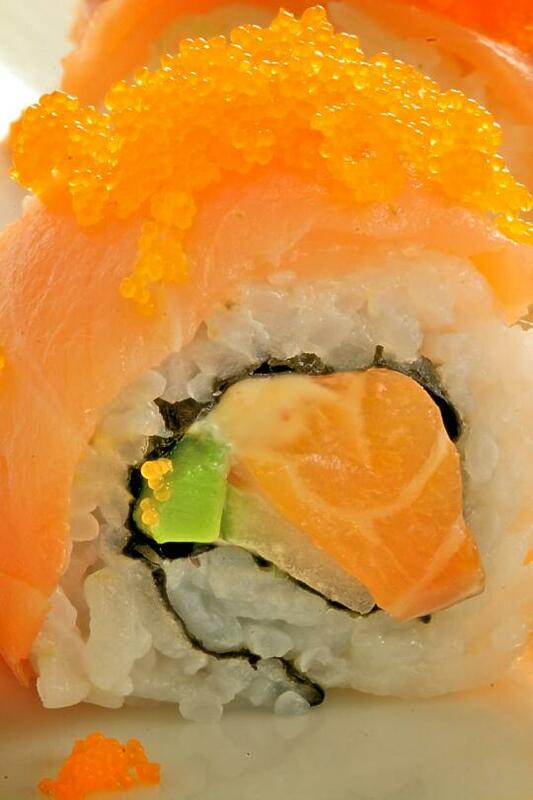 Roll the sushi inside-out, using cucumber, avocado, salmon, and the spicy mayonnaise as your fillings. Drape the smoked salmon slices over the roll, and use a piece of plastic wrap to press the smoked salmon into the sushi. 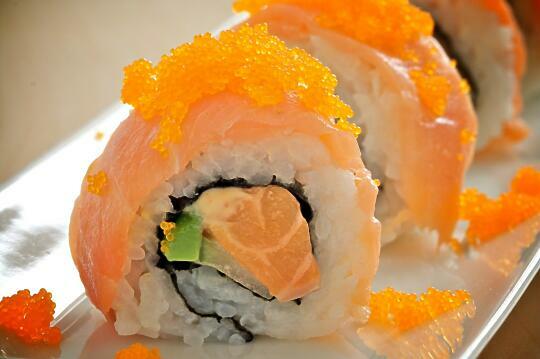 Slice the sushi into 6-8 pieces, using a sharp knife. 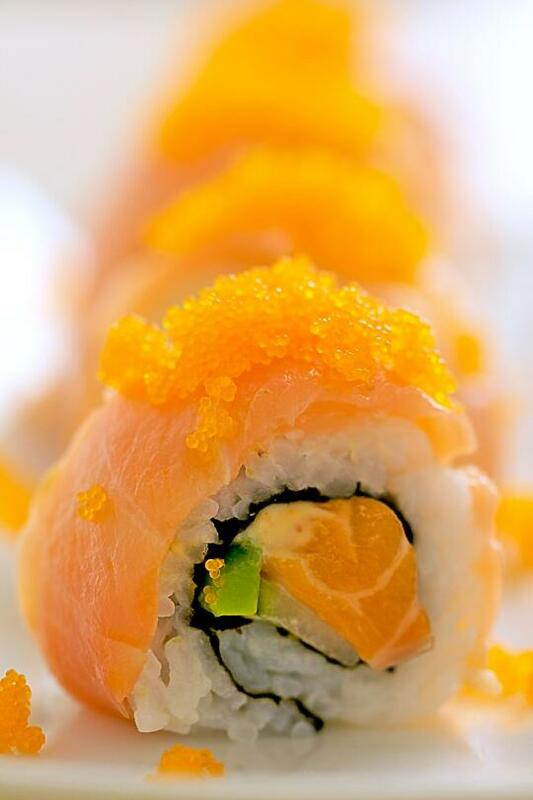 Carefully scoop a little pile of tobiko onto the top of each roll. Great Roll!!! great pictures!!! congratulations! That’s gorgeous! And very thoughtful. PS You started Harry Potter in grade school? Way to make me feel old… I started that when I was 18!!! So are you doing this roll only for saving yourself from the bullets of the MwP? That is simply gorgeous. (I bet it’s delicious too.) Smoked salmon? I’d have never thought of that. And what better post for the now infamous: “Hereâ€™s what the site looked like when we drove by”. Brilliant, Allison! My mouth is watering looking at those photos of the roll. It looks delectable, delicious, and divine. I am not much (not at all) of a sushi chef, so I’ll have to ask my local bar to give this a roll for me. Thanks! One of my favorite sushi is seared salmon. I had never known that a blow torched sushi could be incredibly tasty until I had one. I’m not a big salmon fan, but I love this. I really don’t want to insult you. It was just so funny to think that Shadow Sushi would do such stuff I had to mention it. I believe you, you wouldn’t do that for real. Ian – It’s an amazing roll – if you have someone make it for you, let me know how you like it! Sadao – I haven’t tried seared salmon yet, but believe me I want to! You know you’ve hit celebrity status when people start naming food after you. Thank you so much Sushi-girl! You’ll have to tell me how to make this. I may have eaten a lot of sushi, but I have no clue how to put it all together. Ok, that’ll teach me to skim. I have been politely reminded by our gracious hostess that if I hadn’t have skimmed and gotten caught up in the sheer excitement of having my own sushi named after me I would have noticed the recipe is right there in the post. Well, that *does* sound yummy. Now I just have to figure out if they sell nori or wrappers around here or if I have to turn that into cannelloni? YAY! I found a sushi that James will eat! 😀 If you have an Asian store near you, they should sell the nori or spring roll wrappers, or both. Or if you have a grocery store with a decent international section, they might have them as well. Well, I live in a small French-Canadian community of about 10,000 people. We have one main street where you can stand at one end and see the other. I’d say an Asian store is about two hours away, and I’m lucky if my grocery store has soy sauce. I love your photography, we need more like this on our site, Mouth wathering!! Glad I used today to look up new blogs. Saturdays are good for that haha.